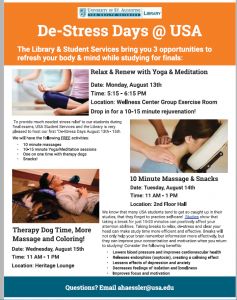 NMLM Feature: De-Stress Days for Students but not so De-Stressful for Librarians! 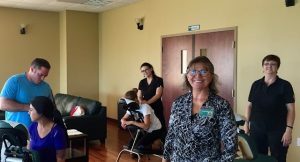 Here at the University of St Augustine for Health Sciences, our students work very hard and take little time for relaxation. 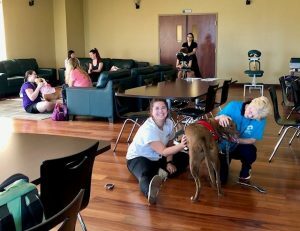 Last summer I heard that Student Services (SS) on the Austin, TX campus held a De-Stress Fest prior to finals with therapy dogs, massage therapy, meditation and healthy snacks. I decided the St Augustine campus students needed their own de-stress event too. I approached SS and asked if we could put something like this together here. The answer was a resounding yes, if I did the leg-work, they would provide the budget. This was great because our library doesn’t have a budget for these types of projects. I am not sure who at the Austin campus decided to use the term De-Stress to describe the campus event, but I liked the alliteration of De-Stress Days and De-Stress Fest so stayed with it for our campus. The flyer I was sent about the Austin campus event referenced an online article titled Taking Breaks Found to Improve Attention by Rick Nauert Ph.D. Provide students with opportunities for breaks as well as tools for relaxation. Provide a variety of options and times for students to participate. Encourage students to see the Library and library staff, as well as Student Services as resources for more than just providing access to materials, answers to questions or a quiet place to study. For Day two, 2 graduating PTs volunteered to do massage during the student lunch break and we provided healthy snacks. Massage: Contracting with outside massage therapists was the costliest part of the program. I felt strongly that the students shouldn’t work for an event that is for the students. I reached out to my professional association, the Florida State Massage Therapy Association (FSMTA), through their Facebook page and asked for LMTs interested. I located three local LMTs able to provide the service on the date we selected. I asked for copies of their licenses and liability insurance and confirmed they were able to receive payment through our company credit card. We ended up with 3 LMTs on Day 3 and they provided massage sessions for thirty-two students. Therapy Animals: We used the Therapy Animal Coalition, based in Jacksonville, FL. I originally arranged for three dogs and one cat but someone in our campus administration questioned having the animals at all due to allergies and requested we at least not have the cat. The students were excited about the event before and after and we are all looking forward to doing it again in December. While there is little I would do differently for the next time, there were a couple of problems to be aware of going forward. First, I did not have enough snacks and drinks, they were all gone in less than an hour. My original budget allowed for about $250 for the snacks and drinks. I, naively, only spent less than $200 thinking it would be enough. While the number of students we have on campus is variable with a lot of blended classes, I would at least double the amount of snacks and drinks I purchased next time. Second, less than two days before the certified therapy animals were scheduled, I received an email from the interim campus director questioning our plans. Because our campus student services person had approved it through the Student Services department, it had not occurred to us there may be other approvals we would need. I was told we did not allow animals on campus because of allergies and other problems. I informed her that these were certified therapy animals and were used by the Mayo Clinic as well as other institutions for similar events. Furthermore, we had the therapy animal teams scheduled to be in one room and not wandering around campus, so I did not believe there was any problem with allergies, injuries or phobias. However, I was worried I may end up having to cancel the best part of the event before it even got started. Frankly, I was feeling devasted and unsupported, thankfully, the Student Services advisor assured me we were fine, and approval was given by his department head. Finally, we were able to get the okay from this person but going forward I would have to make sure to include her in the initial planning to avoid any conflict. My final recommendation, if you are considering a similar event is get at least twice as much food and drink as you think you need and make sure all the campus (or whatever your institution) bigwigs are informed of your plans well ahead of time! Pomputius, A. a. (2018). Mind over Matter: Using Technology to Improve Wellness. Medical Reference Services Quarterly, 37(2), 177-183. 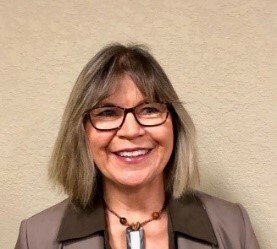 Ruhlmann, E. (2010). Libraries, Hospitals Join Forces to Promote Wellness in Body and Mind. American Libraries, (4), 14.